ジュエリーブランド MAYU Accessoriesのポートフォリオ。｜Official website of MAYU Accessories, Tokyo Japan. 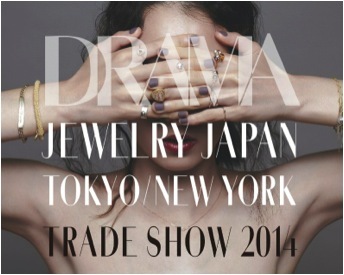 DRAMA JEWERLY JAPAN trade show introduces more than 10 fine jewelry designer brands from Japan to the North American market this spring/summer 2015 season. In its second edition, the trade show highlights a new vanguard of jewelers from across Japan. With an emphasis on detail and originality, the designer brands utilize the finest materials while using production techniques unique to Japan. DRAMA is a project of six brick-and-mortar stores in Japan carrying the finest Japanese jewelry. In New York, the DRAMA showroom expansion aims to introduce our network of jewelers to the world. By providing sales, public relations, and business services, the mission of DRAMA is to cultivate a new movement of beauty from Japan. *Complimentary refreshments to be served.